more a problem to disinfect water in remote areas where electric power is not available. Two of natures gifts, Sunlight and Salt help to produce a strong disinfectant in a technologically advanced process. “Sunclor” Solar Electrochlorinator produces Liquid Chlorine (Sodium Hypochlorite) from common salt and Solar power. When sodium hypochlorite is injected into water it kills all the disease causing pathogens and renders the water pure. 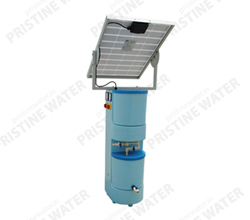 Solar Electrochlorinators are available in small capacities (5 grams/hr) and medium capacities (25-100 grams/hr) The disinfectant generated by this system can be directly injected into water or wastewater to disinfect up 60,000 to 1,000,000 liters of water per day depending on the system size and level of contamination (see table). Sunchlor 5 is a compact solar powered electrochlorinator which produces 60 grams of chlorine in every batch of 8 hours. These 60 grams of active chlorine can purify and disinfect 60,000 liters of water. It is extremely easy to operate and most suited for the disinfectant generation for urban and rural villages, large swimming pools, hotels, hospitals, residential colonies amongst others for removing of bacteria &amp; virus from water.This equipment is a total system by itself. It comes integrated with the Solar panel, Reaction tank, Hypo tank and Power supply all rolled into one single unit. The system is pre-wired and piped, so it can be installed any were without any civil foundation or support stands. Sunchlor 25 to Sunchlor 100 These systems can produce larger amounts of chlorine to disinfect water from 200,000 litres to 1,000,000 liters. 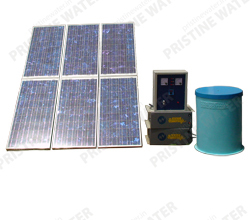 This system comprises of the Solar panel with support frame, the reaction tank, the hypo tank, power supply and dosing pumps. The sodium hypochlorite produced can be injected into the water tank or pipeline where the disinfection is to be carried out. It is a batch process system, with Eight hours batch time. Titanium Electrolyzer is fixed inside the Reaction tank. Electronic timer for accurate time. It utilizes state-of- the-art solar technology for battery charging. Solar Panel comes complete with mounting stand. Control module contains the Power controller, Timer and Battery. Small towns and villages for their water treatment facilities to disinfect drinking water. Schools, Educational institutions in remote areas for Drinking water. Pour water into the tank and mix well. Switch on the power supply. Power from the storage battery will start the reaction. Set the timer at 8 hours. The system will start and the chlorine production will begin. After the preset time the power supply will stop. Now the Sodium Hypochlorite is ready. Open the bottom Valve and remove all the sodium hypochlorite into the storage tank. The sodium hypochlorite solution can be dosed from the storage tank to the water to be disinfected. After production stops, the Solar panel continues to charge the batteries for next use.